ARE YOU A YOUNG WOMAN who wants to talk money + make some new friends? I’m hosting an intimate evening with my friend Van Baird, an expert in financial planning, to bring young women together to talk about all things cash money— budgeting, student loans, saving, and planning for a bright future. This event is meant for young 20-somethings who want to get a better grasp on financial freedom and making money moves. The event is free + space is limited to only 25 individuals. 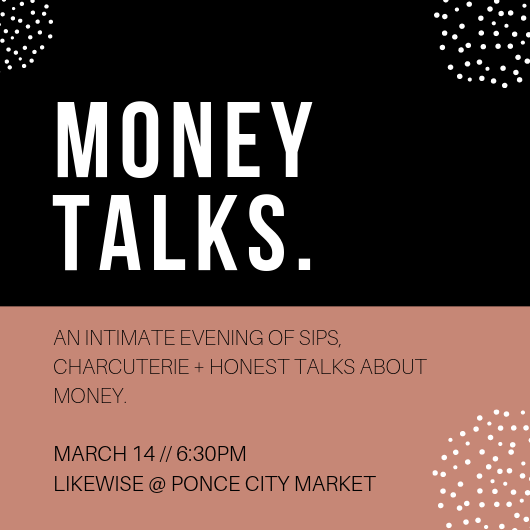 It will take place at Likewise at Ponce City Market in Atlanta on Thursday, March 14. Event runs from 6:30 to 8:30. Please fill out the form below and we will reach out to you to confirm your RSVP or let you know you’re on the wait list! Any money topics that matter most to you? Thank you! We will be in touch shortly to let you know the status of your submission!